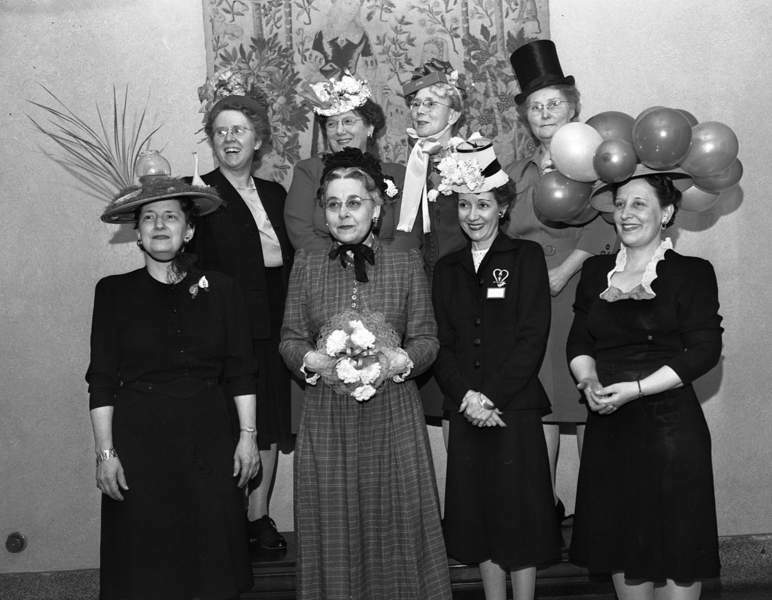 Members of the Business and Professional Women's Club showed off their fun hats at a "Hollywood Party" on April 14, 1947. "Business Women's Club Entertains 102 Members at 'Hollywood' Party"
The Business and Professional Women's Club entertained 102 members at a "Tom Brenneman Breakfast in Hollywood" party at the Fort Wayne Woman's Club with Miss Katherine Smith and Mrs. Gertrude Fish as co-chairmen. Paul Havens of Radio Station WGL impersonated Tom Brenneman. Members attended in a breathtaking array of hats including those representing at May pole, bird's nest, furnished apartment, luncheonette, deck of cards, concert hall, lamp, etc. Miss Alice Fisher, club president, was given a hat of fresh flowers and Miss Mary Tumbleson was presented a corsage by Mrs. Florence Gibbs for being the "good neighbors." Miss May Lansdown received the orchid from Hollywood for being with the same employer the longest number of years and Miss Helen Stamets received the "wishing ring" from Mrs. Fish. Mrs. Veda Curtis received a special prize given by Miss Clara Klomp and other special prizes were won by Miss Esther Whitacre, Miss Hilda Baltes and Mrs. Henrietta Erber. Mrs. Izetta Atkins Mills won a prize for having the most outstanding hat, Miss Lorene Broxon for the oldest hat and Miss Alice Baker for the smallest hat.